Whilst I am on a roll I will continue with the dreaded lunchbox.......I shouldn't keep saying dreaded, however I have met very few mums who actually enjoy filling this small plastic box. And ....it is such an important part of their school day as it provides the nourishment and energy whist out of your care. Which brings me to the point of how so many of them can look like a plastic 'party bag'!! Sorry to keep going on and on but I am passionate about feeding our kids well at school. I help in the classroom a few hours per week and I see how some of our little ones are returning from their breaks- if I said a Mini minor with a V8 engine on board, I wouldn't be too far from the truth! We need to be sending them off with slow release carbohydrate foods such as grain sandwiches, low fat dairy foods, bakery items based on grains and bran and fruits preferably with the skin on. All these foods will give them a slow release blood sugar rise helping them to concentrate and stay calm. Many parents ask me what they can put on their sandwiches that will sustain them as well as last in the lunchbox. meat, chicken and fish are fine when you eat them fresh however don't have a great staying power in the lunchbox. Dips are the underutilised sandwich filler as they are high in protein and some are high in iron and fibre. Examples are hommus, refried bean salsa, guacamole, baked beans mixed with cream cheese or leftover spag bol (or any leftovers for that matter)blended with plain yoghurt or Philly cream cheese. They give the humble sandwich staying power- better than a plain Vegemite, jam or honey sandwich which lasts them 20 minutes! Place all ingredients in food processor and blend until the mix reaches the required consistency. This recipe makes 2 cups. Children love to help operate the food processor. Once the lid is on it is very safe, although keep a close eye on them. GREAT post Kate! Sometimes I worry my kids aren't making the best choices in the cafeteria, but I hope with parents who try to live really healthy lives (diet & exercise)they're following our example. 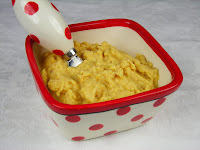 I LOVE chickpeas by themselves, but I'm going to try your hummus recipe today and take it to some friends! Have a great day and thanks for writing such a wonderful blog! Woo hoo...just got your book!! Can't wait for it to arrive!! Great Post! I agree, my kids are still at home but it can be a challenge to think of new ideas for their lunch.